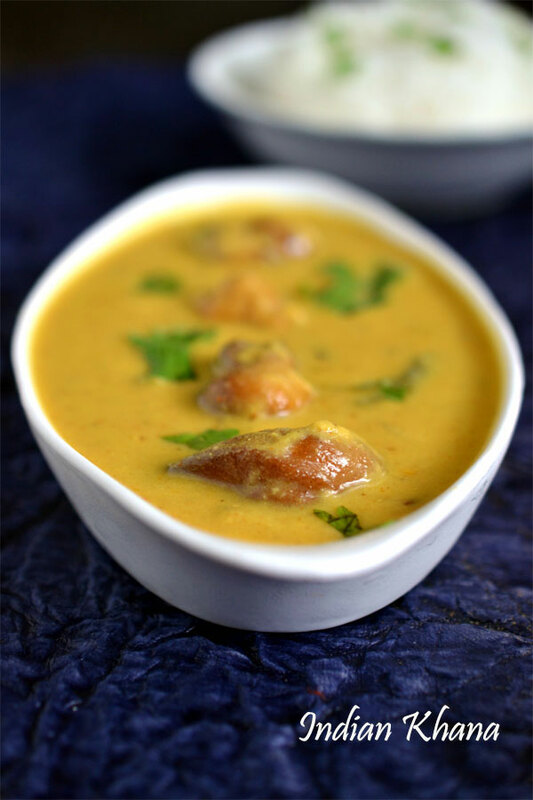 Kadhi Pakoda or Kadhi Pakora is excellent side dish with steamed rice and prepared in various method across various states in India. Basic besan, yogurt mix remains same but the flavoring differs in most of the kadhi recipes of course not considering Sindhi Kadhi in which yogurt is not used. 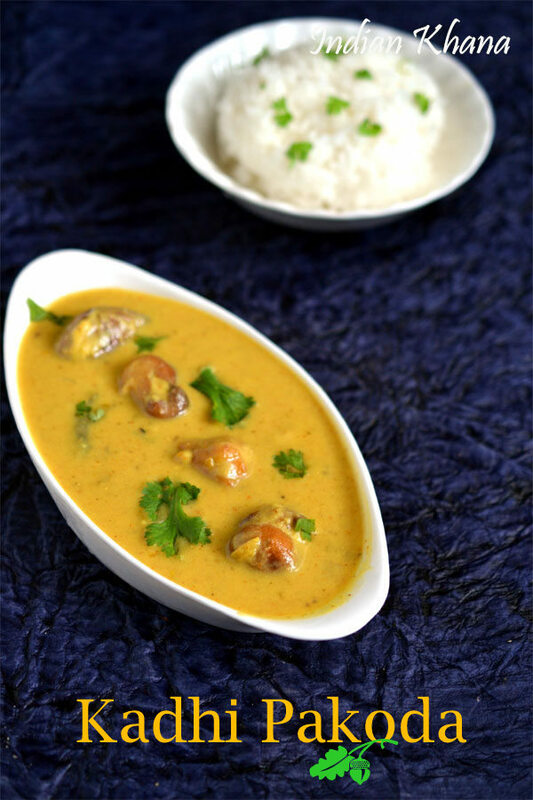 Kadhi pakora or as we call it kadhi chawal since normally kadhi is served with steamed rice or jeera rice for a delicious and comfort meal. There's nothing like hot pipping kadhi chawal and if it happens to be kadhi with pakoda then it's gets better. I love kadhi chawal with or without pakora so I am fine either way, but then I don't make kadhi very often since DH is not fan of kadhi and I have seen most of the men doesn't like kadhi chawal for some unknown reason ! Today's recipe of kadhi pakora is of Chhattisgarhi style which I learnt after watching closely my SIL preparing some time back. 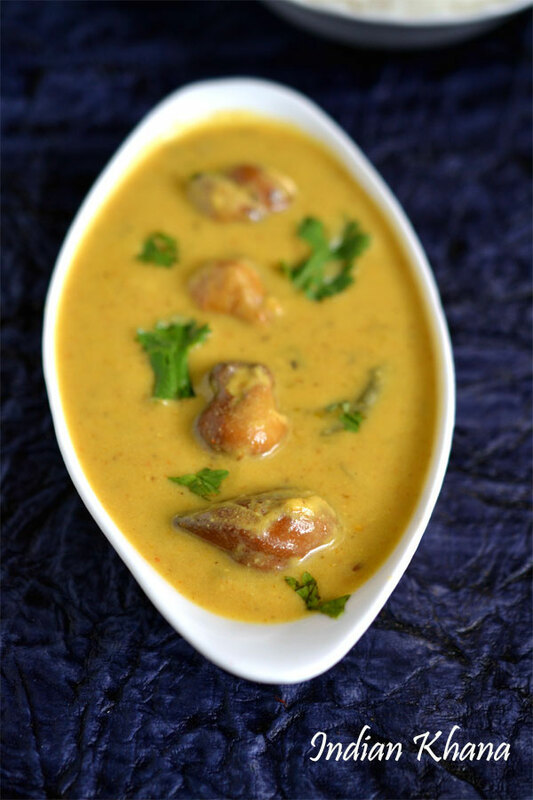 My SIL is big kadhi fan and she makes excellent kadhi of various types and this plain pakora kadhi is one of the speciality too. There are also Kochai (Arbi or Taro Leaves fritters kadhi, patra kadhi made apart from popular Punjabi, Gujarati kadhi. 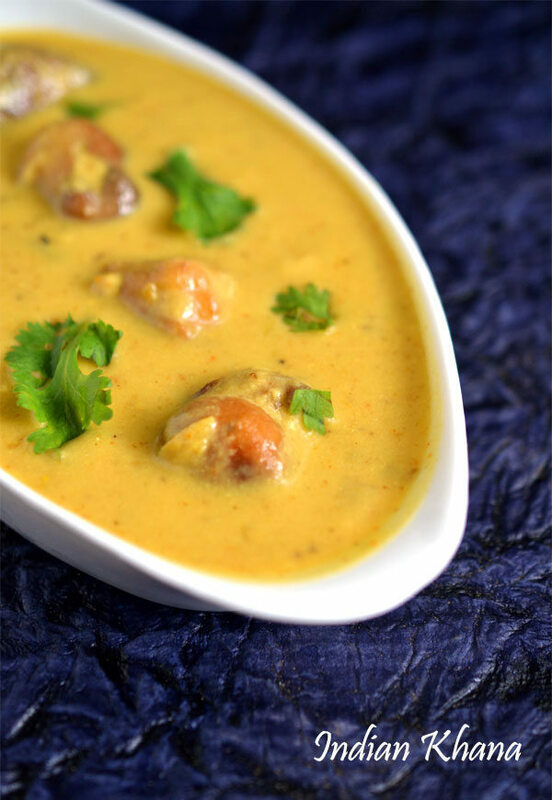 I have few kadhi recipes in my draft but some how I never manage to post any of those recipe and this time I dragged myself to share with you all this simple and yummy kadhi which is different of plain kadhi. Besan (chickpeas flour), yogurt and spices curry with plan besan fritters. In a wide bowl mix all the ingredient 'For Pakoda' except oil into smooth batter, it should not be thin but thicker than normal pakoda batter. Heat oil for deep frying in a wok and drop small amount of batter to make small pakoda 6-7 in a batch and fry both sides until golden brown, repeat same for rest of batter. Peel and slice onion, chop tomato, coriander leaves and slit green chilies. In the pan or wok heat oil, add hing, garlic, cumin seeds and let garlic becomes golden brown. Now add onion, green chilies, curry leaves and saute until onion becomes soft and brown. Add red chili powder, coriander powder, turmeric powder, salt and mix well, cook for a minute in slow flame. Add tomato, cover and cook until it gets mashed. While the masala getting ready prepare kadhi batter, in a wide bowl beat curd add water and whisk well to make butter milk. In another bowl take besan, turmeric powder, chili powder, salt add little water and make smooth batter, add prepared butter milk and whisk well to combine everything well, keep aside. Once masala gets cooked well and oil starts to separate, add besan/kadhi batter and mix well, keep flame slow to medium and let it come to boil. 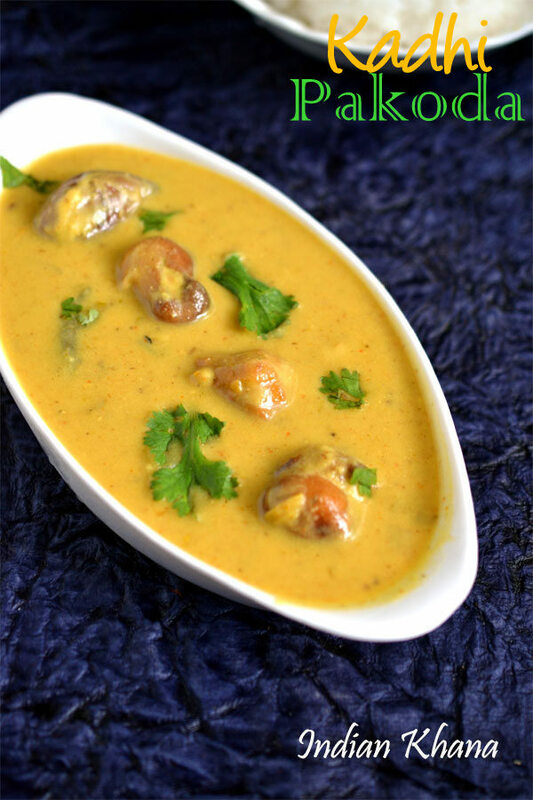 Slow flame now, cover and let kadhi simmer for 8-10 minutes or until besan gets cooked, adjust salt if required. Add pakoda, stir and simmer for another 5 minute in slow flame. Add chopped coriander leaves, mix and off flame. 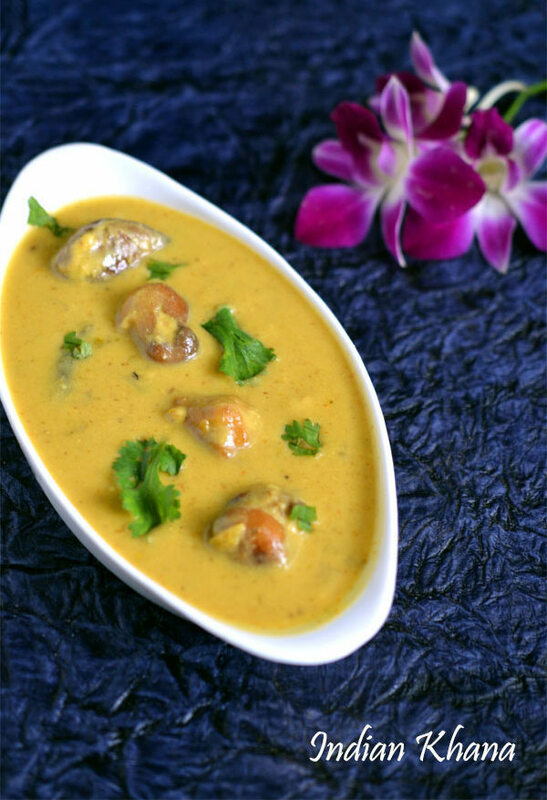 Let the kadhi stand for minimum of 10 minutes before serving. Server warm with steamed rice.